My second favorite holiday is Valentine’s Day. I know, I know. I should hate it, but I am weak in the presence of pink and red hearts. And since I was completely delinquent this holiday season on the card front, I decided to send Valentines to my friends and family. I love the novelty of conversation hearts (comes with the territory of favoring a “Hallmark Holiday”) so I designed a candy-inspired card of my favorite things. It should be noted, I have a hard time committing to ‘favorites’. 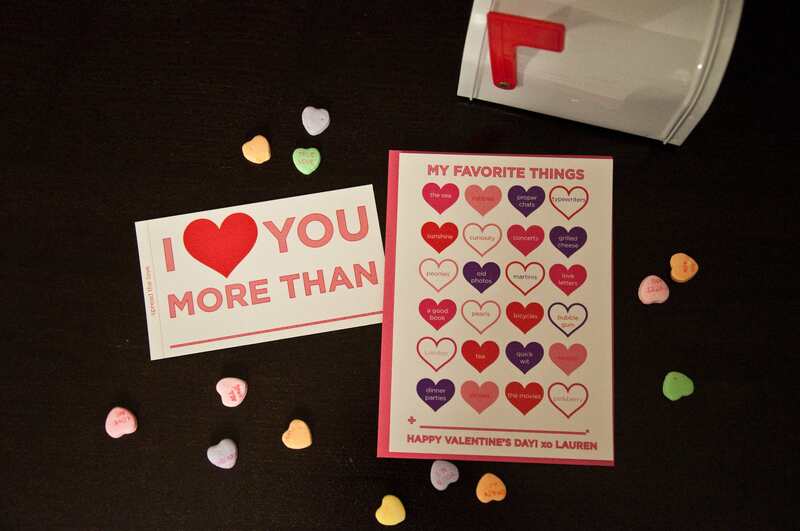 In an attempt to convert V-Day haters, I enclosed a pass-along Valentine of the fill-in-the-blank variety: I LOVE YOU MORE THAN_________. the sea, rubies, proper chats, typewriters, sunshine, curiosity, concerts, grilled cheese, peonies, old photos, martinis, love letters, a good book, pearls, bicycles, bubble gum, London, tea, quick wit, sequin, dinner parties, stripes, the movies, pinkberry… and a zillion other wonderful somethings! Printed by the wonderful Village Copier. Envelopes from Paper Presentation.